Book your hotel and resort transfers from heraklion airport. TransferPlan will transfer you from Heraklion airport to Phalasarna - Falasarna as quickly, safely and comfortably as possible. Heraklion International Airport, "Nikos Kazantzakis" is the primary airport on the island of Crete and the country’s second busiest airport after Athens International Airport. It is located about 5 km east of the main city center of Heraklion, near the municipality of Nea Alikarnassos. It is a shared civil/military facility. TransferPlan will transfer you from and to Phalasarna as quickly, safely and comfortably as possible. The exotic beach of Falasarna is located 59km west of Chania city and almost 17km west of Kissamos, at the western base of Cape Gramvousa. Phalasarna or Falasarna was an ancient harbour town in Minoan Crete and the ruins of the city are still visible in the northern side of the beach. The remains that still exist were built around 333BC. There you will find several imposing sandstone towers and strongholds, with hundreds of meters of fortification walls protecting the town. You will also see the remains of a harbour protected from all sides by walls. 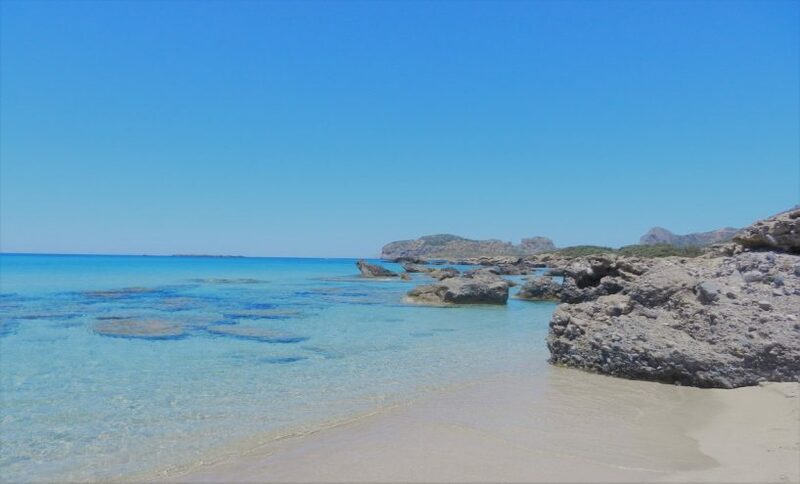 Falasarna bay is one of the most famous beaches in Greece, which has been awarded as the best beach of Crete and voted as one of the 10 best beaches in Europe in the past. Falasarna extents a large area and consists actually of five consecutive beaches, with the two most central being the most favourite. The sand in Falasarna is whitish, making the watercolour tropical. Indeed, if you're lucky and be here on a day that is not blowing from the west you will be enchanted by the beach and its turquoise waters. The main beach of Falasarna is called Pachia Ammos. It is an exotic beach with a length of 1km and a width of 150m. This beach attracts the most visitors in the area, but because of its length, it never seems too crowded. The beach offers umbrellas and a few snack bars and cafes where you can get food and water. There are also services for water sports and beach volley courts. There is another long beach north of the main beach having a length of 800m, identical to the main beach, which is separated into several smaller beaches. This bay is divided in half by a sand dune and a few rocks. The beach is quieter than Pachia Ammos and offers no facilities. Further north, near the archaeological site, there is a small cove facing to the south. It is pebbly and the seabed is rocky. It is a good choice when the winds blow from the west or you seek isolation. South of Pachia Ammos, at Livadi, there is another long beach that has sandy shore and rocky seabed. It is a very good choice for fans of the snorkelling. Livadi is surrounded by a very important wetland with fishponds, which host many birds in winter. The area around Falassarna is magnificent and is a protected nature reserve. If you have time and are looking for something romantic, you can wait for the sunset, which is considered the best in Crete. It definitely worth your visit and the tremendous landscape will pay you off. Book your Crete transfers now. Enjoy a high-quality service at the lowest prices. Best price guaranteed. That’s why we are Crete’s favourite airport transfer company.